Background: High mobility group box 1 (HMGB1) is a cytokine proinflamation which contributes to inflammation. HMGB1 physically interacts with toll like receptor 4 (TLR4) to release macrophage cytokines. 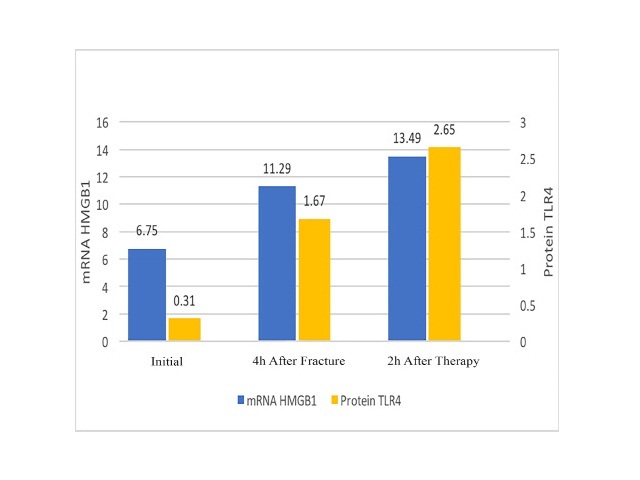 The aim of this study was to demonstrate the effectiveness of systemic lidocaine administration to inhibit the expression of HMGB1 mRNA and TLR4 protein in mice BALB/c mice with sterile injury. Material and Methods: Twenty adult male BALB/c mice were divided into lidocaine and control groups. A sterile injury is done by closed fracturing the left thigh bone of the mice. The lidocaine group was treated with 2 mg/kgBW lidocaine through tail vein injection after 4 h of sterile injury. The control group was given distilled water therapy as a substitute for lidocaine. Mice blood is extracted from the tail vein before trauma, 4 h after trauma, and 2 h after the administration of lidocaine and distilled water is complete. The HMGB1 mRNA expression was examined by quantitative real-time polymerase chain reaction (qPCR) while the TLR4 protein level was determined with enzyme-linked immunosorbent assay (ELISA) according to the manufacturer’s instructions. Result: The HMGB1 mRNA expression and TLR4 protein levels in BALB/c that sustained inflammation due to a sterile injury was significantly decreased in the lidocaine group (p < 0.00). Conclusion: Administration systemic 2 mg/kgBW of lidocaine is effectively inhibits HMGB1 mRNA and TLR4 protein in mice that sustain inflammation due to a sterile injury. Sirait RH, Hatta M, K.Arief S, Simanjuntak TP, Suprayogi B. Profile of HMGB1 mRNA Expression and TLR4 Protein in BALB/c Mice Model Sterile Injury after Systemic Lidocaine Administration. Pharmacognosy Journal. 2018;10(3):586-589.